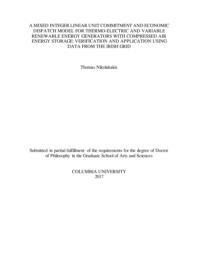 The objective of this PhD thesis is to create a Unit Commitment and Economic Dispatch (UCED) modelling tool that can used to simulate the deterministic performance of a power system with thermal and renewable generators and energy storage technologies. The model was formulated using mixed integer programing (MIP) on GAMS interface. A robust commercial solver by IBM (CPLEX) is used as solver. Emphasis on the development of the tool has been given on the following aspects. a)	Technical impacts of Variable Renewable Energy (VRE) integration. The UCED model developed in this thesis is a high resolution short-term dispatch model. It captures the variability of VRE power on the intra-hour level. In addition the model considers a large number of important real world, system, unit and policy constraints. Detailed representation of a power system allows for a realistic estimation of maximum penetration levels of VRE and the related technical impacts like cycling of generators (part-loading and number of start-ups). b)	CO2 emissions. High levels of VRE penetration can potentially increase consumption of fuel in thermal units per unit of electricity produced due to increased thermal cycling. The dispatch of units in the UCED model is based on minimizing system wide operational costs the most important of those being fuel, start-up costs and the cost of carbon. Fuel consumption is calculated using technical data from Input/Output curves of individual generators. The start-up cost is calculated based on times the generator units have been off and the energy requirement to bring the unit back to hot state. Thus dynamic changes on fuel consumption can be captured and reported. c)	Technical solutions to facilitate VRE integration. VRE penetration can be facilitated if appropriate solutions are implemented. Energy storage is an effective way to reduce the impact of RE variability. The UCED model includes an integrated Mixed Integer Linear (MILP) compressed air energy storage (CAES) simulation sub-model. Unlike existing CAES models, the new “Thermo-Economic” (TE) CAES model developed in this thesis uses technical data from major CAES manufacturers to model the dynamic effect of cavern pressure on both the compression and expansion sides during CAES operation. More specifically the TE model takes into account that a) a compressor discharges at a pressure equal to the back-pressure developed in the cavern at each moment, b) the speed of charging can be regulated through inlet guide vanes; higher charging speed can take place at the expense of additional power consumption, c) the maximum power output during expansion can be limited by the levels of cavern pressure; there is a threshold pressure level below which the maximum output decreases linearly with pressure. Since it uses actual power curves to simulate CAES operation, the TE model can be assumed to be more accurate than conventional Fixed Parameter (FP) models that don’t model dynamic effects of cavern pressure on CAES operation. The TE model in this thesis is compared with conventional FP models using historical market prices from the Irish electricity market. The comparison was based on the ability of a CAES unit to arbitrage energy for making profit in the Irish electricity market. More specifically a “Base” scenario was created that included the operation of a 270MW CAES unit with technical characteristics obtained from a major CAES manufacturer and assumed discharge time of 13hr. Various sensitivities on discharge time, natural gas prices and system marginal prices (SMPs) were modeled. An additional scenario was created to show the benefit on CAES profitability if the unit participated in both the energy and ancillary services markets. All scenarios were modeled using both the TE and FP CAES models. The results showed that the most realistic TE model returns around 15% less profitability across more scenarios. The reduction in profitability grows to around 30% when the cavern volume (discharge time) is reduced to half (6 hours). The latter is related to the sensitivity of the TE model on cavern pressure that is being built faster when the volume is reduced. A CAES unit won’t get a positive net present value (NPV) in Ireland under any scenario unless SMPs are greatly increased. Thus, it was shown that that existing FP CAES models overestimate CAES profitability. More accurate models need to be used to estimate CAES profitability in deregulated markets. Additionally, it might deem necessary to create additional markets for energy storage units and increase the possible revenue sources and magnitude to facilitate an increase of storage capacity worldwide. The second step of analysis involved the integration of the CAES and UCED models. The UCED model developed in this thesis was validated and applied using data from the Irish grid, a power system with more than 50 thermal generators. A vast of existent data was used to create a mathematical model of the Irish system. Such data include technical specifications and variables of thermal generators, maintenance schedules and historical solar, wind and demand data. The validation exercise was deemed successful since the UCED model simulated utilization factors of 45 out of 52 generators with an absolute difference between modeled and actual results on utilization factors of less than 6% (the absolute differences are called Delta in this thesis). In addition the results of validation exercise were compared with the results of a similar exercise where PLEXOS was the modelling tool and it was found that the results of the two models were similar for the vast majority of generators. More specifically, the PLEXOS model results showed higher deltas for the coal-fired generators compared to the UCED model. On the other hand the UCED model, reported higher delta values for peat-fired generators. The results of the PLEXOS model were slightly better for the gas-fired generators while both models reported deltas nearly zero for all oil and distillate-fired generators. Finally the model was applied to study the benefits of energy storage in Ireland in 2020 when wind penetration is expected to reach 37% of total demand. The analysis involved the development of two groups of 3 scenarios each. In the first group the main scenario also called the “Reference” was used to simulate the short-term unit (30 min step) commitment within the Irish system without storage. The results of the reference scenario were compared with two additional scenarios that assumed the existence of one 270MW CAES unit in Northern Ireland by 2020 (again the first scenario involved the TE and the second the FP CAES model). The results showed –when using the TE model- that the inclusion of one 270MW CAES unit in AI can help reduce wind curtailment by 88GWh, CO2 emissions by 150,000 tonnes and system costs by € 6 million per year. If an FP model had been used instead the reductions would be: wind curtailment by 108GWh, CO2 emissions by 270,000 tonnes and annual system costs by €13 million. Two main conclusions can be obtained from the specific set of results. The first conclusion is that storage units have a financial benefit over the whole system. Thus, when a CAES unit operates to minimize the costs of the whole system can incur substantially more benefits compared to if the CAES unit operated to maximize the individual unit’s profits as in the case presented earlier. The benefits of storage over the whole system should be accounted to make policy decisions and create incentives for investors to increase energy storage capacity in national grids. The second important conclusion is that existing CAES FP models overestimate the ability of a CAES unit to facilitate VRE penetration. More accurate TE models should be used to assess a unit’s capability to increase system flexibility. A second group of scenarios was created to simulate the benefit of CAES at even higher VRE penetration levels. In the second group the “Reference” scenario again, assumed no storage however, wind production was increased by 25%. Again the “Reference” was compared with two additional scenarios that assumed integration of 3x270MW=810MW of storage capacity in AI (one scenario used the TE model and the other the FP). The results for the TE model show that each of the 3 CAES units reduces wind curtailment by 188,000MWh, total system costs by €29 million and CO2 emissions by 180,000 tonnes. The same reductions for the FP model are 217,000MWh of wind curtailment, €25.6 million on total system costs and 180,000 tonnes of CO2. Thus, the results of the second group of scenarios show that as the installed capacity of both CAES and wind increases in Ireland a) the system-wide benefits of CAES increase and b) the differences on results between the TE and FP models become much smaller.